Tired of the back ache from lifting cases of beer and liquor or struggling with stacking, re-arranging and moving heavy and awkward beer kegs? Well that's all in the past with Alcohol Controls' new Keg Lifter. 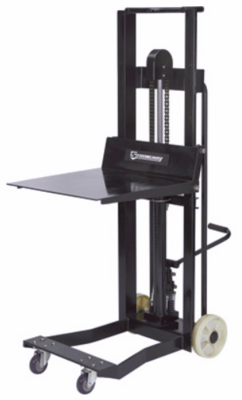 Simply place the desired item that needs lifting onto the rugged and stable 22" by 22" platform and with a few pumps of the hydraulic foot pedal your item is raised to desired height (up to 51") and can be slid into place. The Keg Lifter is safe and easy for one person to handle loads up to 750 pounds, so a 160 pound beer keg is no problem. It has two large nylon rear wheels and two front swivel casters for maximum maneuverability in tight spaces. Say good bye to the back pain and worrying if today's going to be the day that you get hit with a workers comp claim from an employee who hurt their back trying to lift a beer keg onto a shelf in the walk in cooler. 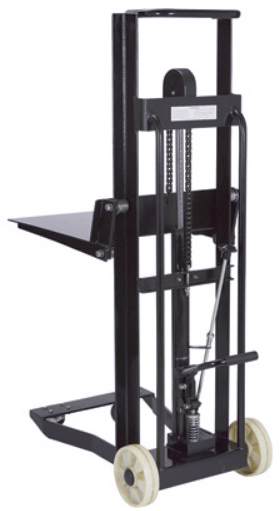 The Keg Lifter comes fully assembled and ready to use right out of the box and is ideal for bars, nightclubs, restaurant chains, sports arenas etc. ** Make sure to ask about our $150 Keg Lifter Rebate. * Our 'Free Freight' offer is valid only for the Keg Lifter and only to locations in the 48 contiguous US states. Call 800.285.2337 for shipping rates for Alaska, Hawaii, Puerto Rico & Canada. Offer does not apply to any other products on AlcoholControls.com or Bar-Products.com. PLEASE NOTE: The manufacturer of the Keg Lifter has recently changed the color from red to black (pictured above).